Please refer to our stock # 1653 when inquiring. 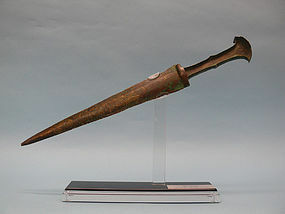 Magnificent Luristan Bronze Sword, ca. 900 - 800 BCE. Found in the Holy Land, beautiful patina due to age, intact and in excellent condition. Bronze is 14 1/2" long x 1 1/2" wide. On custom stand dimensions are 9 1/4" high x 14 1/2" wide x 2" deep. Typical categories of canonical Luristan bronze artifacts in­clude cast animal finials, standards with masters of animals, horse cheekpieces, and harness attachments in the form of naturalistic or fantastic creatures, figured and disc pins, whetstone handles, and bracelets. Among the weapons are swords, daggers, axes, maces, quivers, and halberds. Both casting and repoussé techniques were employed. Among the highly stylized human and animal forms the zoomorphic juncture plays an important part, especially on pins, bracelets, and weapons.